With Just Jenifer, Janet Lambert introduces the Jordon family to her readers. 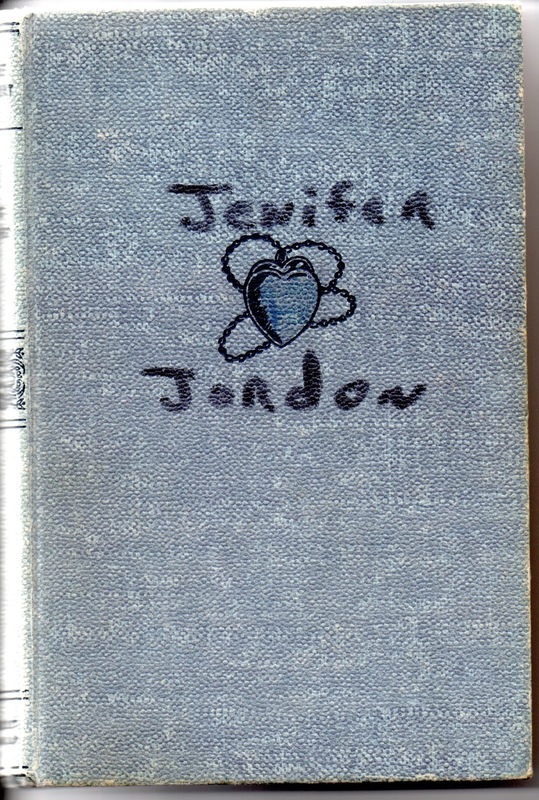 As the book opens, sixteen-year-old Jenifer Jordon is taking care of her many brothers and sisters in Orlando. Her father General Jordon is off in Italy fighting in the war. Things get increasingly complicated when their housekeeper has to leave for a family emergency, and Jenifer is left to care for the family alone. But first: let's meet the very complicated Jordon family! First, we have Jenifer, who was five years old when her mother died, "leaving her to watch over a four-year-old Peter." When she was eight, her father married again, and she acquired two ready-made sisters, Gwenn and Alice, who were a little younger than Peter. When she was ten the twins were born (Neal and Susan). Then Vance, then Bitsy, then General Jordon's second wife passed away. In addition, General Jordon's nephew Donny came to live with the family when his parents were killed in a car accident. Jenifer fires the housekeeper, which leaves her alone with the children and one servant, Rosie, "who was big-boned and willing and had trailed along with the Jordons from an army post in Kansas, but she never knew Bitsy's left rubber from the right or believed in clocks or routine." Jenifer decides not to go back to school (despite her love of writing) and plans to run the family like the army that is such a part of her family's life. They need to follow her orders, take on responsibilities like k.p., and if they get in trouble, the family will hold a court martial. The family even plans on daily reveille and retreats. She talks curmudgeonly storekeeper Mr. Cadwallader into renting his late son's house (on a lake with a garden and room for the family horse Prince Royal) to the family. On the way, the family picks up a few extras, including Mr. Cadwallader's daughter Lacey, lonesome officer Andy Compton, and a new family dog, Rollo. In an endearing scene, Andy helps Jenifer get Prince Royal hooked up to a carriage. "The young lieutenant took off his blouse and dropped it on the grass as if he'd been looking a long time for a fight, and when he flung his cap beside it Jenifer saw that his hair was golden-red, not sunburned. Looking at his stubborn lower lip that had a jaw to match it, Jenifer untied Royal from the palm tree and thought it would be fun to watch two redheads battle each other." During a quiet afternoon and lost in thought, Jenifer meets Cyril, when he is drawing her picture without her notice: "'Would you mind frightfully turning your head a little? I'd like to catch your profile.'" "He was an odd-looking boy. His face was very thin and he had dark long-lashed eyes that seemed to have burned all the color out of his white skin. Only his mouth looked alive, as if it and his eyes, together, had battled the life from the rest of his face. His brown hair was wavy and worn too long, in the careless effect movie actors have stolen from artists and poets; and studying him, Jenifer thought that but for his modern white cardigan and carefully creased gray slacks he might have posted for Percy Bysshe Shelley sitting with a pencil clasped between sensitive nervous fingers." British Cyril is different than the hardy army boys that Jenifer knows. He came to stay with his Aunt Kate after his brother and sister were killed in an air raid. His aunt is suspicious of Jenifer and her rambunctious family and their influence on delicate Cyril, but after Jenifer collapses of exhaustion in Mr. Cadwallader's store, Aunt Kate relents. She sends over her housekeeper's sister Ellin to help out, and Jenifer is to take lessons with Cyril's tutor so she can finish school. "Ellin McCarthy got out of the car and leaned over to shake the wrinkles out of her ample black skirt. She was a big, jolly woman with twinkling eyes above a button nose and her Irish brogue rolled out musically. 'Tis a pleasure to do what I can for ye, after ye bein' so good to me Patrick,' she said, 'and I'm glad to be takin' the motherless darlin's under me wing.'" The families become closer, Cyril gets tougher and stronger, and he and Jenifer grow closer. Meanwhile, Andy has been asking Lacey to marry him for ages, and when he finally actually declares his love, she accepts. The book wraps up with Andy and Lacey's wedding, and Cyril heading off to Long Island with his aunt, bringing Gwenn, Alice, and Donny for company. "'Remember,' she said, standing before the screen door and surveying them, 'you're a soldier's children. You're 'army brats.' And don't you do anything, ever, that will reflect discredit on that soldier or will make the army ashamed to have you as a part of it. Will you remember that?'" Yes, they will. And with that, the good-bys are said and Cyril and company board the train to New York. "He saw them all as the train moved along: Bitsy, Neal, Vance, Susan, Peter. And looking out at them he knew he would always see them, the little Jordons, as an obbligato in a concerto, as the background in a painting. For him, the motif, the lovely figure in the foreground was, and always would be, just Jenifer." Ah! Very lovely. Reading this book just reminded me of a few things that Janet Lambert must have really loved: the army, horses and above all, big families with all their joys and challenges. Even only child Lacey and officer Andy can't stay away from the lure of the dynamic Jordon family. And it is astonishing that Jenifer manages to take care of all the family. I can feel the relief when Ellin comes to stay, and a few of the children are sent off for a while. It's an excellent introduction to this large and complicated family.